Maui Resort Rentals: Honua Kai Hokulani 446 - Spacious 2BR w/ Partial Ocean & Mountain Views! • Free Maui Resort Rentals courtesy shuttle offering service between Honua Kai and a number of West Maui locations. • Decades of cumulative hospitality experience from leading brands such as Marriott, Westin, and Ritz-Carlton. • Only manager with 8000+ sq. ft. of office and warehouse space just steps from Honua Kai…readily poised to serve you. • Free “Ohana Play Package” with Tommy Bahama beach chairs and umbrella, BBQ equipment, and portable beach cooler. • Complimentary pack 'n plays, booster seats, high chairs, sand toys, rollaway beds, Bose bluetooth stereos, and air mattresses upon request (based on availability). • Professional grade Vitamix blender and locally sourced Maui Organics signature bath amenities in all managed properties. • Unmatched customer feedback…together our properties have over 1000 five-star reviews on VRBO. Mahalo nui (many thanks) for visiting Hokulani 446 at Honua Kai. Hokulani 446 is a luxurious two bedroom suite offering gorgeous views of the both the blue Pacific Ocean and the lush West Maui Mountains. Suite 446 affords a perfect opportunity to gather, reconnect, and celebrate. The suite can accommodate up to six guests in two king-sized beds and one queen-sized convertible sofa sleeper. Get swept away into the lovely Maui sky after folding away the glass doors and allowing the interior to blend seamlessly with the outdoors. Enjoy quick easy access to fresh pool and beach towels on demand because this suite is enrolled in Honua Kai's towel tracker program. Free upgraded 300 Mbps high-speed wifi is available to you and is included in the daily parking amount, which also provides the option of complimentary valet service. Complimentary booster seats, high chairs, sand toys, rollaway beds, Bose bluetooth stereos, and air mattresses are also available upon request (based on availability). With warmth & aloha we invite you to 'InJoy' Hokulani 446. As local Honua Kai experts with a prime location directly adjacent to the property, Maui Resort Rentals is perfectly poised to assist in providing you with an unsurpassed Honua Kai experience. All of our Honua Kai rentals are expertly cared for and undergo a rigorous five-phase cleaning process before every check-in, and our Ritz-Carlton and Marriott trained staff are dedicated to providing you with the highest level of customer service. With staff available 24/7 and a 10 minute response time guarantee, you can be rest assured that your comfort is our highest priority. A commitment to excellence has fostered the growth that has recently earned us recognition from the Pacific Business News as the fastest growing vacation rental company in the state of Hawaii. For us, the only thing better than calling Maui home is the privilege of sharing it, so let us help you make your Maui vacation dream a reality. West Maui has everything you could possibly ask for when traveling to the best island destination in the world. For fun in the sun, West Maui boasts a remarkable concentration of world-class beaches. 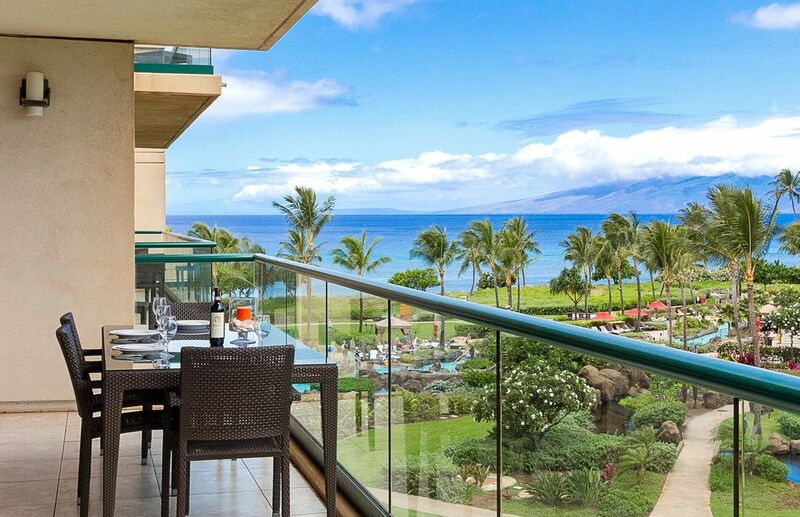 The luxurious resorts of Kaanapali and Kapalua offer plenty of choices for upscale dining, golf, spas, and shopping. The magical backdrop of the Pacific Ocean and Maui’s neighbor islands of Lanai and Molokai deliver some of the most breathtaking sunsets you are ever likely to witness. Whales can be seen splashing off the coast in the winter and the summer gives way to Maui’s only spots for parasailing and jet-skiing. Lastly, the historic town of Lahaina is just minutes away, and is home to shopping, dining, Maui’s most critically acclaimed Luau, the iconic Banyan Tree, and one of the largest art markets in the world. Privacy mingles with an exceptional vantage point of the Pacific Ocean and West Maui mountains in this distinctive two bedroom suite. Offers pool, property and oceanviews. Free upgraded 300 Mbps high-speed wifi is available in your suite. We provide bath & hand towels as well as wash cloths for your stay. This suite is also enrolled in Honua Kai’s towel tracker program so you can get fresh pool and beach towels at your convenience. The living room has a three seat couch that converts to a queen size sofa sleeper. Features a spacious 235 sq. ft balcony with plenty of room to relax and "in-joy" partial ocean and mountain views! Dirty carpets, worn-out and soiled furniture , out of date television. Kitchen was marginally stocked. Virtually no bowls. TV so out of date Netflix or Prime were not accessible. Carpets so dirty your socks literally were soiled walking on them. Living room furniture old, tired and soiled. Hideabed was so bad it was unusable,forcing our adult son to sleep on the floor instead. As a couch it was very uncomfortable. The two living room chairs similarly not clean and terrible to use. This is a tired condo and not worth the money. Very disappointing. We travelled with four adults, our four year old and 8 month old. We requested pack n play, high chair and they also provided a booster chair and beach toys for the 4yo. Which was fantastic. The room had a nice partial view to the ocean. There was some construction noise from where they are building the luana garden villas though but we mostly just turned out chairs towards the ocean view. The carpets should probably be replaced or cleaned more regularly. The bathrooms were very nice, spacious and modern. Lots of towels were provided. Went to use the kettle and someone had left ginger in the pot. The nozzle on the fridge for the water needs to be cleaned. Drank water from it the first night and had to go out the next day and buy flats of water. The pull out bed was terrible. You can feel the bars digging into your back. We asked if they could do anything about it and they did provide extra bedding and a blow up mattress. Having a washer and dryer was great. The dryer does not seem very efficient though so dont overload it. The parking underground is very tight and there are pillars everywhere. But we seem to get lucky and get ones close to the doors. The resort itself seemed to be very clean and all the grass and trees are nice and well manicured. The pools were nice, two big pools, one lazy river, five hot tubs and water slide. The 4 yo loved the pool. The beach itself isn’t the nicest but is very close and walkable. I would recommend wearing water sandals if you plan on swimming out as it is quite rocky bottomed. The sand is coarse and not fine, and waves do pick up some rocks So be careful. The restaurant Dukes was delicious. We went there several times for breakfast and dinner. The Macnut banana pancakes were delicious as was the banana leaf fish at night. Overall we had a very pleasant stay and would come back. If we do come next time, we would probably stay in one of the 3 bedroom suites to avoid anyone having to sleep on an uncomfortable pull out bed. Excellent place to stay with a family. This was our first trip to Hawaii with our family (two adults and three school-aged children). This property absolutely exceeded our expectations. The unit was very well appointed and comfortable. Everything we needed was provided and nothing was difficult during our stay. The owners clearly have thought of everything. The wifi is fast and reliable, which was important with multiple devices going at times. Breakfast and morning coffee on the lanai was just like being in paradise. The views are spectacular and even with a bit of construction going on it didn't take away from the enjoyment. The resort is great and perfect for families with children. The beach is just a few steps away. There are a few different pool areas and cabanas for rent. The food and drinks served from Duke's was all very good. Everyone we encountered at the resort was friendly and eager to help us. I highly recommend this property and will return again. Thank you for making our stay in Maui so memorable! We had a great stay at Honua Kai Resort. The property is really nice and maintained well. Our unit 446 was clean and well cared for. On vacation I usually miss my bed the most but the beds were very comfortable. Having the washer and dryer was good. You can pack less ( always a plus). That said the dryer takes forever!!! They do tell you that upfront so it is not a surprise. The resort has several pools to choose from. They were supposed to have an adult only pool... they did not. So if you don’t like kids in the pool with you you’re not going to like that. The hot tub situation... there were 5 I believe. Kids were always in them as well if you go during the day. Night time was more adult. Not a deal breaker for us. The hot tubs definitely needed more cleaning. I’m sure it was a sunscreen issue. Overall a great stay. We would definitely come back to this resort and book the same room. They do an amazing job making you feel like on vacation. It was clean and had a beautiful view with huge wide open doors. There was construction outside our patio which wasn’t mentioned but we just positioned our chairs towards the ocean. The rental company was amazing! Great people making our trip amazing! Located on West Maui's Kaanapali North Beach.